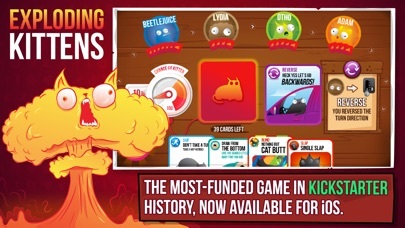 Exploding Kittens® App Data & Review - Games - Apps Rankings! 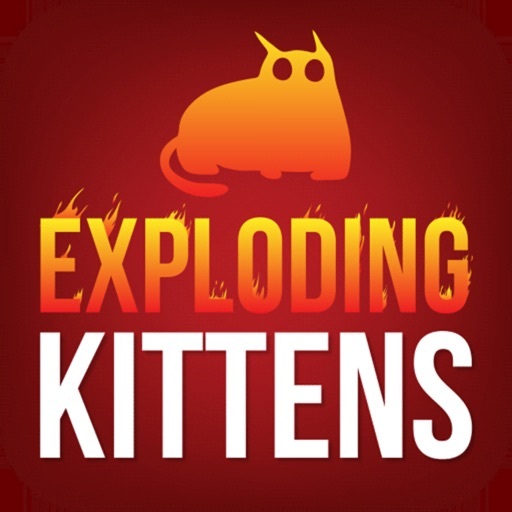 The applications Exploding Kittens® was published in the category Games on 2016-01-21 and was developed by Exploding Kittens. The file size is 233.18 MB. The current version is 4.0.1 and works well on 8.0 and high ios versions. 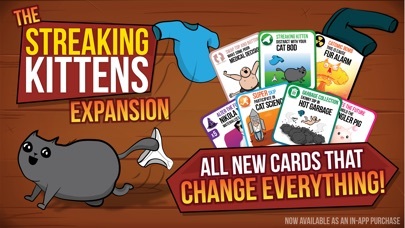 Do you like Exploding Kittens® applications? Please share! Only just buying the physical card game today I thought I would get some practice on the app first and I am absolutely LOVING THIS GAME!!! This game is awesome, but it gets boring after a while since there is no point besides beating the cpu and your friends a couple of times. Adding a ranking system or some cards you could earn or something like that would be so cool. 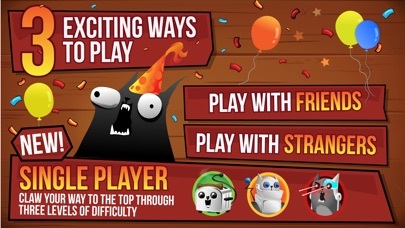 Something to keep people playing. So much fun Fix coming? 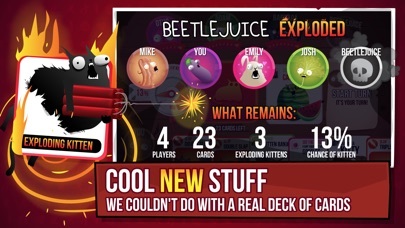 Exploding Kittens the app is even better than the physical card game (although I does lack the ability to see the tears of your opponents when they explode). If you’re unfamiliar with the game, you draw a card from the deck and hope it’s not a kitten. If it is, boom! You’re out, unless you have a defuse card. You can play as many cards as you want before drawing a card but drawing a card ends your turn. Your goal is to get all the other players to explode by forcing the other players to take extra turns, skip your turn, and other tricks. Drawing a card is nerve wracking but this version puts a probability meter up so the tension is heightened. Games are usually a few minutes each. With the ability to start a game online, it’s a great way to kill time. You can choose a variety of prewritten messages to post so players get a sense of the tension from the other opponents if the wish to post. 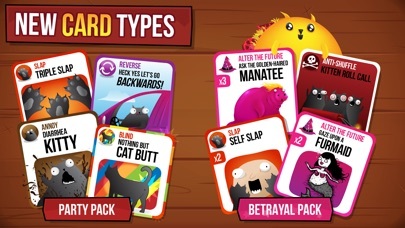 In-app purchases let you play with a more varied deck. I’ve not picked up any of the expansion packs yet. But it is tempting to change the way to play with new cards. All in all, good game. Why not get a copy yourself and jump into an online game. You might just come up against me! The test of any game is, if a kid can pick it up, play it and have fun with it! Well guess what? I made the mistake of buying this game for my 7 year old granddaughter. Firstly you HAVE to be connected to the net for it, so travelling in the car it was useless. When we got where we were going, she was keen to try it. Got it out again and we got two reactions from her. Confusion and disappointment. She wasn’t able to make any sense of this game whatsoever. She was disappointed because she was looking forward to playing it. A case like this makes you understand why people should have the right to try something like this before they pay for it, or have a period in which to reclaim your money. Total waste of time, total waste of money. 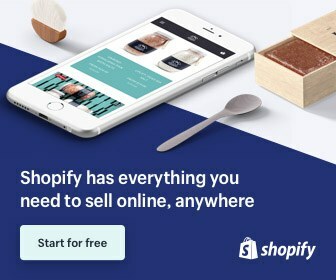 DO NOT BUY THIS APP. Knocking a star off as for the price of the app itself, all decks should be available without in-app purchases. The game is great though!! Really really good game! My best recommendations! Love the game. Could do with one or two additions. Such as win loss history. A great version of a fantastic card game. Great game, though the optional party deck is a bit too annoying I think. It really needs the Nope cards as they exist in the real card game. Not as much fun without it, it's too static. Also make the NSFW deck available as add on please!